You’ve invested a tremendous amount of time, energy and money in building your practice. When it comes time to sell, you deserve a brokerage that will get you the right purchaser, the right purchase terms and the maximum return on your investment. We understand that every practice owner is unique. It is seldom just a case of getting the most money you can. Usually there are a number of other interests or concerns. Do you want to stay on in the practice full or part time? Do you want a short or long transition? What about staff and patients? Does it matter what type of person and dentist the purchaser is? We will take the time to really understand your interests and concerns. Then our multidisciplinary team will tailor a sales strategy to meet your needs. Your appraisal matters – a lot! 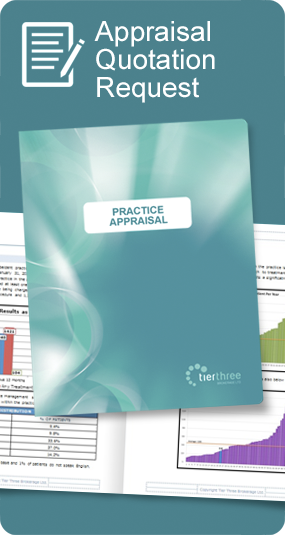 The appraisal of your practice is the key document that a purchaser and their advisors will rely on for information about the practice. Not all appraisals are created equal. At Tier Three, we have designed our appraisal to give purchasers, and their advisors, the information they need to make an informed decision. Our Advanced Patient Metrics© provide a penetrating analysis of your patient base that often identifies and unlocks value that other approaches simply can’t find. Every Tier Three appraisal also includes a detailed cash flow analysis and loan repayment schedule, with conservative assumptions, so purchasers can see how affordable the practice is. The combination of our Advanced Patient Metrics, plus analysis of collections, receivables, and billing practices helps prevent misunderstanding and eliminates common problems people experience on due diligence. Your practice is a tremendously valuable asset. You deserve an appraisal that will properly reflect that. It only stands to reason that if more purchasers are aware of your practice, you are more likely to achieve or exceed your sale objectives – whatever they may be. That is why we were the first company in the industry to allow purchasers to register to get automatic updates of practice listings that meet their criteria. For purchasers this means not having to worry about missing out because they were too busy to check web site listings or journal ads. For sellers it means that we can get your practice in front of a large number of interested purchasers immediately after you list with us. When Tier Three lists a practice our entire team, not just the person who gets the listing, will work hard to sell your practice. Tier Three has assembled a 13 person multidisciplinary sales team with extensive dental, practice management, dental banking and investment industry experience. They each bring their unique perspective and experience to every sale we handle – because having seven minds working on the sale of your practice is a lot better than one. .
We work for you, not the purchaser. And we only get paid when you do. That means that we have your interests front and centre at all times. We don’t have a preferred list of purchasers, nor do we play favourites among our clients. Your practice will get maximum exposure to the pool of available purchasers, substantially increasing the potential to meet and exceed your objectives. We’ll work with you, and your professional advisors, every step of the way. The actual process of selling a dental practice is incredibly detailed and complicated, with extensive interactions between lawyers, accountants, bankers and other professionals. It can be a huge distraction and frustration for the owner who is still trying to run a practice and deliver quality patient care until the deal closes. While you’ll always be fully in charge of the overall process, we will work directly with your, and the purchasers, professionals to minimize your time commitment and involvement in the details as much as you want. At Tier Three we understand that confidentiality is critically important in the sale of a professional practice. It goes beyond protecting highly personal information. 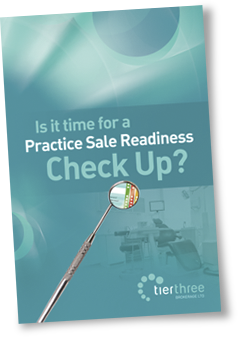 The actual value of your practice can be significantly affected if staff, patients or other dentists become aware of your efforts to sell your practice at the wrong time or in the wrong way. We go to extreme lengths to protect your confidentiality at every step in the process.